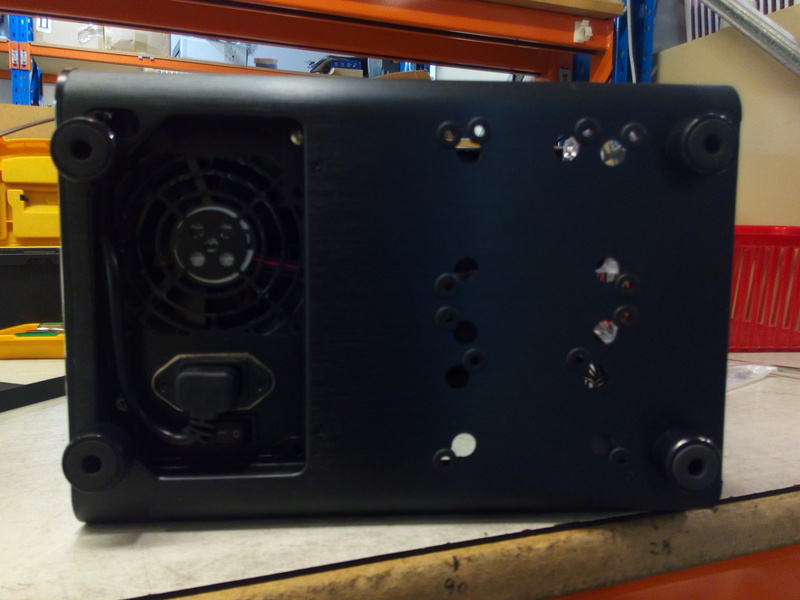 I came across another unusual case in our workshop recently – the Raidmax Atomic, a Mini-ITX case barely bigger than a shoebox. 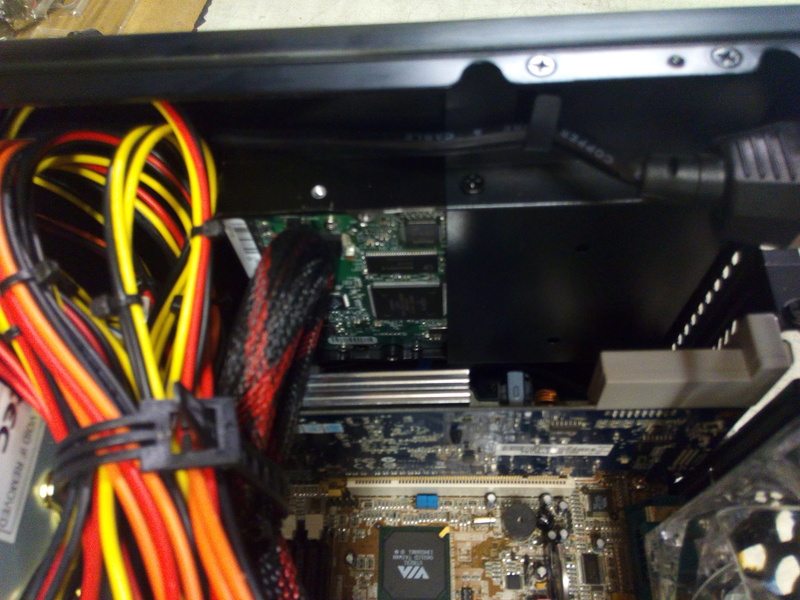 There’s not many people asking us to build Mini-ITX systems these days, what with the Zotac Z-Boxes and other Mini-PCs being so much smaller, so this one was unusual enough to write about. 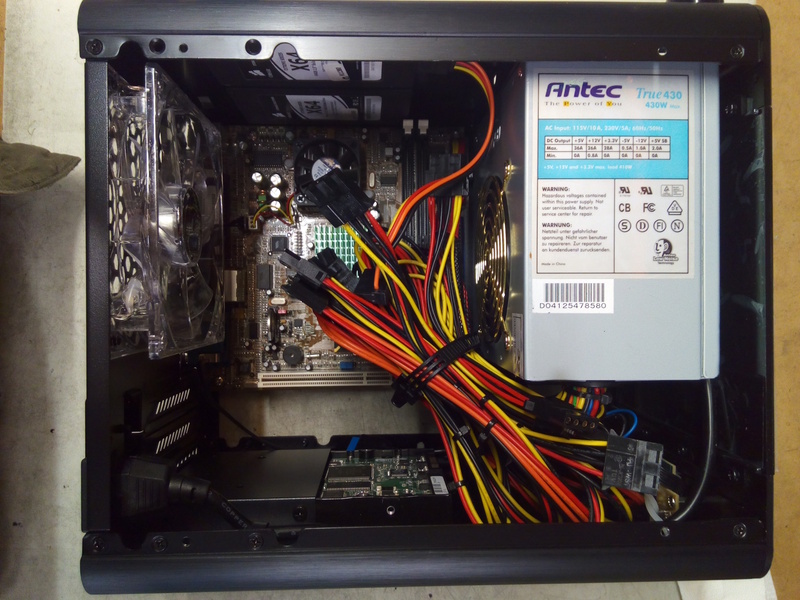 Read on to see how much of a full-fat PC you could shoehorn into this tiny 27 x 19 x 24cm box. It’s a simple cube with no interior partitions to speak of. The shot of the rear from the front here shows the empty motherboard space and single rear 12cm exhaust fan that’s included. 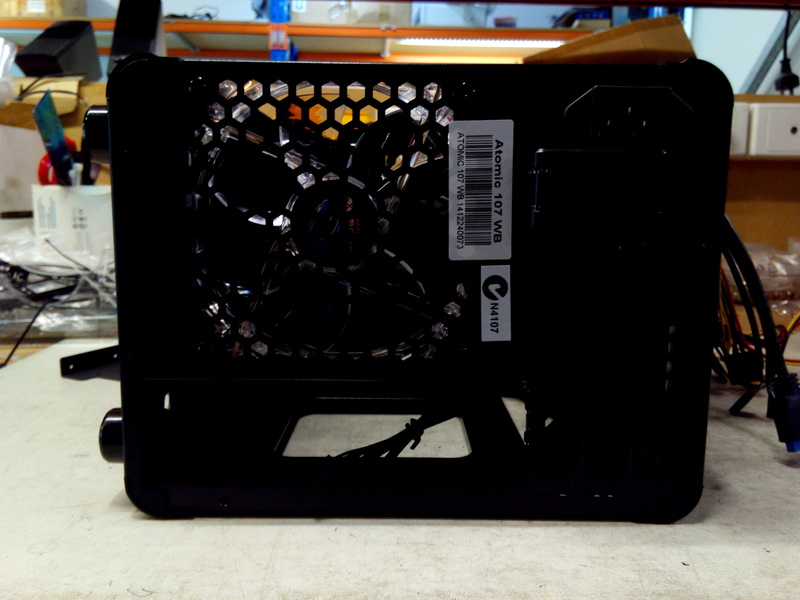 You could replace the fan with a 12cm radiator+fan sealed watercooling combo, as used by Corsair. 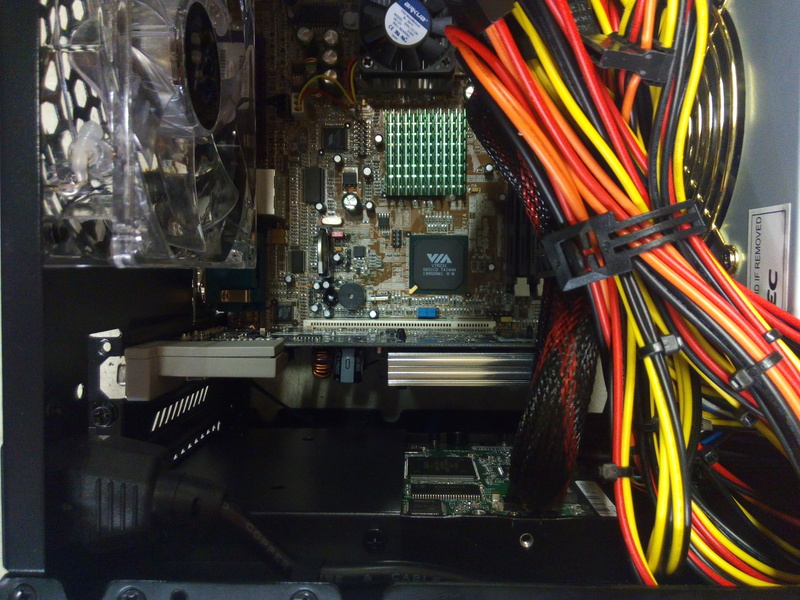 You can just see the power supply pass-through plug on the top-left, for connecting the front-mounted PSU to the mains power. 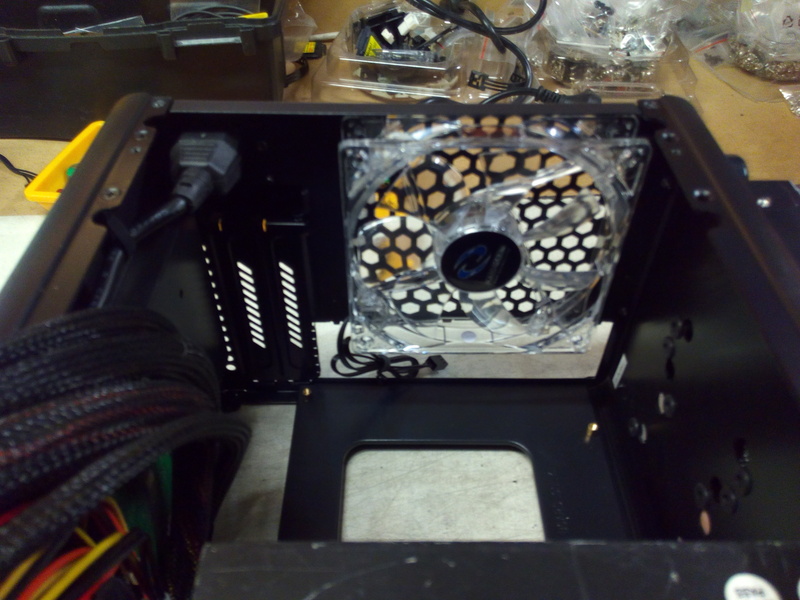 The pic below shows the back from the outside, with the motherboard IO-shield hole just below the fan. The fan is included, but there’s no power supply bundled with this case. You’ll need to grab one separately, but any regular PS2/ATX-sized unit that fits a desktop PC will suit. Here’s a view from directly above with just a workshop power supply installed – you’d want one with modular cables to minimise the number of excess cables to tidy away. 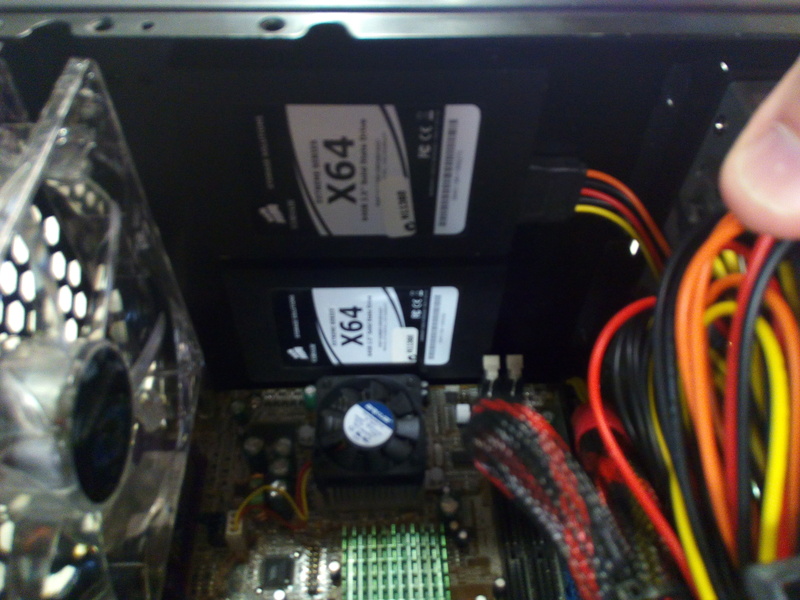 Still pretty squeezy…not sure how you’d get the claimed 3 hard drives in there as well as the rest of a PC. 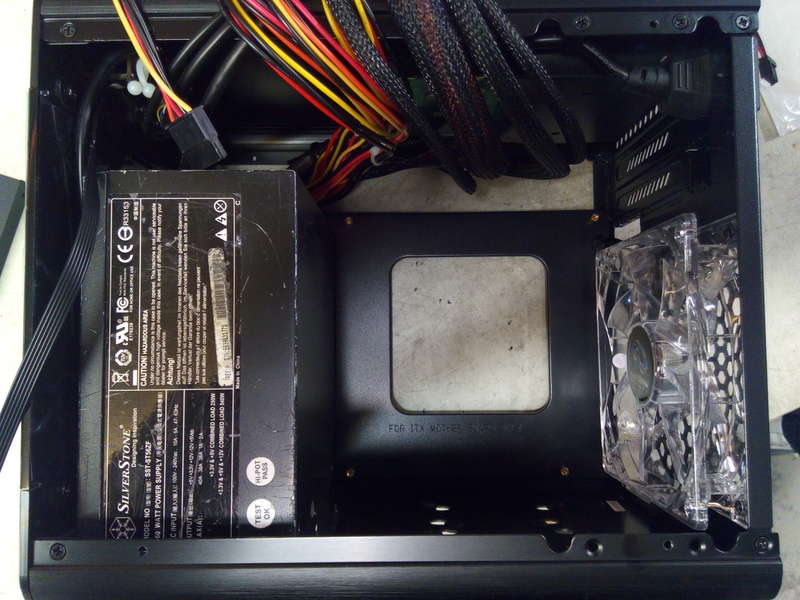 This is the view from underneath – you can see the PSU pass-through plug towards the bottom, and the rubber feet that give the PSU hole some space to duct air into the case. The series of holes to the right are the mounting points for 2x 2.5inch SSD drives or 1x 3.5inch hard drive. Now, I’ve populated it with a Mini-ITX board, a discrete video card, two 2.5inch SSDs, and a 3.5inch hard drive – can you see them all? There’s not as many Mini-ITX boards to pick from, compared to ATX and Micro-ATX sizes, but you can usually find some to support AMD, and Intel’s LGA1150 platforms. There’s the bottom view of the 3.5inch HDD – it’s hidden in the case’s top lid above the expansion slot in the motherboard. Still got room for a small video card there too. A card with a double-wide cooling fan might not get much airflow if there’s a HDD installed there though, and the card needs to be less than 26cm long. Be aware that powerful video cards tend to get very noisy when they get worked hard and can’t get plenty of cool intake air for their fans. Same view of the 3.5inch HDD install from the other way around. You can just see the top edge of the video card between the HDD and the board. Here are the two SSDs – they get bolted to the floor from underneath, and only just clear the edge of the motherboard – whew! You could also put 1x 3.5inch drive there instead of the 2x SSDs. So there you go – a full-fat computer in a shoebox, with regular power supply, 3 drives and a discrete video card – no optical drive, to be sure, but then again, I can’t remember the last time I actually needed one – even Windows 10 comes on a USB stick these days. There’s even some USB and Audio ports in the top lid. 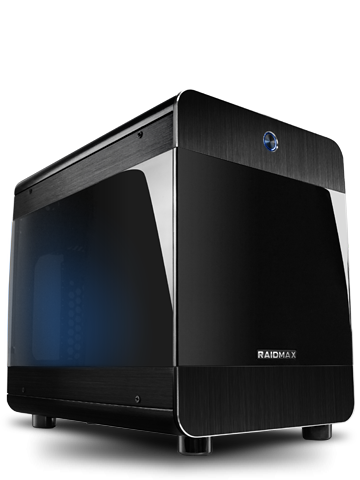 If you actually have a severely-restricted space for your PC, it’s be worthwhile to check the Raidmax Atomic out – at under $100 delivered, it’ll cost a little more than a bog-standard cheapie tower, but it does actually work out pretty well. The case maker’s info page is here, and this case is imported and distributed by AustraliaIT in Homebush. This entry was posted on August 20, 2015, 12:13 pm and is filed under Cases. You can follow any responses to this entry through RSS 2.0. You can leave a response, or trackback from your own site.